Last time for Casual Friday, I offered a satirical video about grammar. Today I offer a language of gesture. 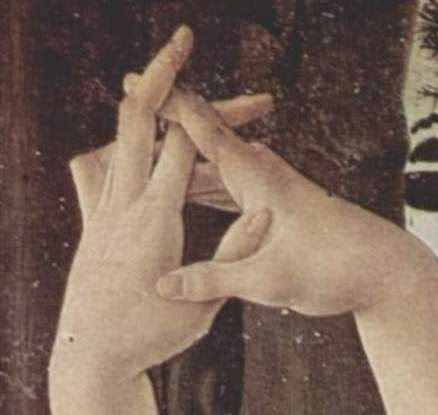 Nearly all of us use hand gestures when we speak, but I believe many will agree that the Italians have raised this to an art form and highly expressive language of its own. So this Friday video is not so satirical but still fun, I hope. Or at least easy on the eyes. Image is a detail of a detail of Botticelli’s Primavera, courtesy Wikipedia. The original is in the Uffizi Gallery in Florence, where a few years ago I had the great privilege of seeing it in person. I don't know about America, but we use a lot of those same gestures around here. Not all, though. My friend always tell me I should go and live in Italy and that I'd go mute if they were to somehow hold down my hands. That was really fun! Thanks for a good smile to start the day. But they missed one of my favorites! The expression equivalent of "che furbo"
It's when you tug downwards along the top of your cheek/below lower eyelid, basically to indicate you think someone is trying to be devious and you're on to them. It can go either way for positive/negative, depending a lot on the facial expression going with it and context. There's even doing it with your middle finger when you really want to send a message about seeing through someone trying to slyly take advantage of you.